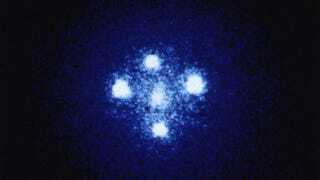 These five lights are all the same object - a quasar. The middle one is the image we would normally see. The ones on the sides are four extra images that we can only see because there is a galaxy between us and the star. How does something getting between us and the star help us see more of it? We'll tell you the secret of Einstein's Cross. When talking about this image, it's tempting to say that only the middle one is the "real" quasar. It's not. They're all the real quasar. But if you followed any of the peripheral images, you'd be lost in space. Only by following the center image would you actually reach the object that's pictured. You'd have to do some fancy footwork, though, because there's a galaxy in the way. The galaxy is the key to this image. It causes something called gravitational lensing - the effect of the gravity of a sufficiently massive object bending light. Any light that gets sent directly at us rolls into the galaxy and out, and to us. We see the quasar. The quasar isn't sending light just at us. It sends out light in all directions. We don't see it all because most of it misses us. But light sent out at a precise angle gets its path bent by the gravity of the galaxy, the way a billiard ball's path gets bent by a depression in the table. The light curves around in an arc, and gets sent to us. Since we only see the light when it hits us, and don't think of it as moving in curved lines, we naturally think it originated just to the left, the right, above, or below the central quasar, and see four new lights. This particular configuration has been called Einstein's Cross.